With A Gourmet Dinner For 40! Many of us travel with food. We fill a cooler with food and drinks when we go camping. We have baskets with plates, plasticware, napkins, tablecloth, and wine glasses for picnics. We pack our lunches for school or work. And, now we are being told we will have to pack our own food to fly across the country. Traveling with food is just something we do. But, when I travel with food, I do it in a big way. In December, I traveled 400 miles with everything I needed to cook dinner for 40 people in the back woods of Northern California, in a snow storm. Everything, meaning all the ingredients, special utensils, serving bowls, my good chef’s knife, linens, and “The List”. The List takes over for my brain. I developed the format for my list when I made the rehearsal dinner for my oldest son’s wedding at his future in-laws house in Klamath Falls. I used it again for my second son’s wedding at the group camping area at Silver Falls State Park. The format did not change for the family reunion dinner to be held at the Mineral Elementary School gym. What did change was the distance to the nearest grocery store. It was a toss up. We would have to go 30 miles through snow to Chester, 40 miles to the grocery chain in Red Bluff, or 61 miles to the natural foods grocery in Chico. I, also would be arriving for Christmas, seven days before the planned dinner. The weather was on our side. It was cold. We all hoped that a trip to anywhere could be avoided. The List had to be perfect. First, we decided on the menu. My daughter-in-law wanted turkey and stuffing, a full holiday meal. I visibly cringed. My first rule for traveling with food is to have as little work to do the day of the dinner as possible. Turkey and its traditional companion foods are last minute labor intensive. I suggested chili, soup, or sauerkraut. She graciously turned up her nose. She obviously wanted a special sit-down dinner for her family. Seafood? No. Beef? No. Chicken? I said no to this one. I do not like to feed poultry to such a large crowd and it takes a lot of handling. Lamb? Hmmm... She thought she might like to try lamb. With the main dish decided, the rest was easy. I would make six or seven appetizers, rice and salad, beverages and desert. Piece of cake! I started on The List. 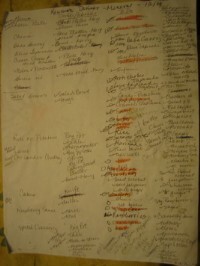 The “to do” list had many things that could be done ahead. I decided to make the cakes and freeze them. I ordered the lamb to be butterflied and frozen. I would pick it up at the last minute and put it into a cooler of frozen foods. With snow all around, the garage would be my mini deli and coolers would keep the critters (small and large!) out of the food. The lettuce for the green salad I love to make was tricky. It had to survive one day of travel and six days of storage before the dinner. The Jan Roberts-Dominguez Salad Box was the answer. The Coop sold me three pounds of mesclun mix right in a plastic tub, just as it comes from their supplier. I brought it home the night before I was to leave, washed it, and spun it in a clean pillowcase off my front porch. I rinsed and dried the tub, lined it with paper towel, and carefully repacked the greens as loosely as I could. I blessed it with a blown kiss and crossed fingers and put it into the car. This, alone, could be a very expensive and inconvenient failure if it did not work. All other perishables went into another cooler, canned and jarred goods, utensils and bowls went into bags. Along with presents for Christmas and the three birthdays we were going to celebrate over the holiday, I took my own suitcase, sketching supplies, winter wear, skis, and a quilt I am working on for a new grandbaby. The big pottery salad bowl was in the passenger seat, securely belted in. Early the next morning I squeezed myself into my small station wagon and headed south. A little over the half way mark to Mineral, my son called with a “few” items he wanted picked up at a natural foods grocery in Ashland. I laughed out loud, but found a parking place in the shade and a nook for everything he needed. As I traveled south, down Siskiyu Pass, the thermometer in my car began to rise. By the time I stopped in Red Bluff for one more errand, the outside temperature was 70 degrees. I did not have the heart to check the lettuce. I moved as quickly as I could and relaxed as I gained altitude heading east. The days before the dinner were filled with grandbabies, holiday cheer, and birthdays. Any spare moment I could find, I would check The List for something “to do”. One day, three year old Noah helped me make cut-out cookies. The death-by-chocolate desert planned for the adults would not entice the children as much as decorating their own cookies with frosting and sprinkles. Another evening, my son and I shelled a bag of raw pistachios. The next afternoon, I candied them to use in the salad. I roasted coconut and chopped cilantro for the chutney. I put rice in the soup pot with sesame oil, butter, and salt. It would be fine for a day or so and would be cooked at the school at the last minute. As I cooked in my daughter-in-law’s tiny corner of a kitchen, I put finished food into its serving dish, wrapped it in plastic, and put it into a cooler. My second rule is to check off a menu item only when it is completely ready to serve. This helps to follow my first rule. Just pull off the plastic and it is ready to go. The day before the dinner I worked hard. I roasted eggplants, sectioned grapefruit, forced raspberries through a sieve, sliced cheeses, made artichoke dip, marinated the lamb, toasted sesame seeds, colored frosting, and crumbled roquefort cheese. All the little containers went into the cooler. By noon of the final day, I went for a long walk in the snow and enjoyed a glass of wine by the wood stove. 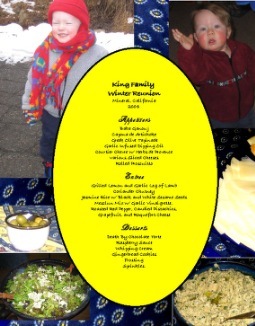 My son loaded the truck, in-laws put out the tablecloths, a friend fired up his grill with the snow falling all around. I cooked the rice and mulled the cranberry juice in the small kitchen off the gym. The lettuce was beautiful! Thank you Jan! I made the vinaigrette in the bottom of my big, purple bowl and several stood around and tore the greens. I added the roasted red pepper, grapefruit sections, pistachios, and roquefort from their containers. We tossed it just before dinner. It was a magnificent centerpiece. The one thing that was not on The List was whipping cream and the local GasMart was out! The owner called her husband in Chester and asked him to buy some for us. It arrived in time for dessert. We whipped it up with a spot of rum while the children gathered around a table to decorate their cookies. Cleanup was a cinch. Everyone pitched in. “What was the bottom line’” you ask. The receipts totaled $267.00. We fed 40 people a home-cooked, sit-down dinner. That comes out a little less than $7.00 per person for just the dinner. There were enough leftovers for everyone to drop in the next day after sledding for a help-yourself lunch. Again, the plastic wrap just came off and everything was ready. They devoured the leftover wilted salad that had sat in the garage for a week before being dressed. They joked about how much they smelled of garlic. They begged for another slice of that decadent chocolate cake. And they all wanted recipes. Was this dinner a lot of work. Yes, it was. But, it was manageable by using The List and picking a menu that did not require last minute preparation. Will I cater a dinner for you? Well..., only for a price, a very big price.